Bookings for EOS&C 2015 registration packages and the gala dinner can now be made by telephone, for those without internet access. Please contact the RHS Ticket Line on 0844 776 6777; payment must be made by credit card at the time of booking (no cheques accepted). Don't miss out on the early-bird registration rates for the European Orchid Show & Conference 2015; prices will rise after 1st December 2014. Register now to get the best value on the various registration packages available including Full, Science, Horticultural, Partner and Show only. The Gala Dinner price will not rise - tickets are still available for the event which includes a drinks reception, four course dinner (including wine) and free prize draw at the Royal College of Physicians (price £70). We have been accepted for the RHS Chelsea Flower Show in 2015! Ouur exhibit will be in the north side of the Grand Pavilion on the Best of British trail. It will highlight our British native orchids and their exotic relatives – home-grown beauties such as Dactylorhiza fuchsii alongside established favourites such as tropical Phalaenopsis and Cattleya. The society is delighted to welcome sponsorship from Albourne Partners Ltd, an independent advisory firm ‎headquartered in the UK with expertise across hedge funds, private equity, real assets and real estate. The event will run from 9 to 12 April 2015 (with a preview on 8 April) and be attended by over 60 exhibitors, including many international traders. There will be a Science Conference at RBG Kew and a Horticultural Conference in the RHS Horticultural Halls. Space at the lectures is limited so please register soon to ensure your place; the early bird rate is available until 1 December 2014. Qualified judges should apply to join the judging teams using the application form available through the website. Trainee judges may apply to assist with stewarding. The OSGB is sponsoring a trophy for Best Amateur Species. 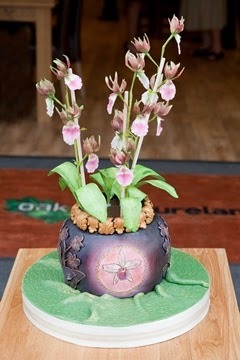 Why not start grooming your orchids for our display – it would be exciting if a member’s plant won this trophy. Once registrants have received confirmation of their show registration they can return to the website to book additional events such as the Gala Dinner. The website is currently allowing registrants to book dinner tickets for only one person but this is being revised and registrants will soon be able to book for spouses/partners/friends – please be patient and await the updated facility. The Gala Dinner is being organised by the OSGB and will be held on Saturday 11 April at the Royal College of Physicians by Regent’s Park. It will include a drinks reception and four course dinner with wine at this award-winning venue for £70.00 per person. A free prize draw will be held during the evening with a number of superb prizes to be won by some of the lucky diners. The Orchid Society of Great Britain has once again applied to exhibit at the Chelsea Flower Show in 2015. This will be the society’s 55th Chelsea display and will celebrate British native orchids and their exotic relations. The OSGB hopes to be included in the newly created Best of British area within the Great Pavilion. Founded in 1951, the OSGB brings together members with a wide range of knowledge and experience who are interested in orchid growing, exhibiting and conservation. This year's Autumn Show will be held on 1st November at Wraysbury Village Hall, The Green, Wraysbury, Staines, TW19 5NA, from 10:30 until 16:00. Registration of plants will be from 09:00 to 11:00 with judging beginning promptly at 11:00. There will be a competitive table show and as this is an open show, non-members are welcome to enter their orchids. Orchids will be on display to marvel at and admire; plants and related sundries will be available to buy from various traders. Entry to the show is free and there is plenty of free parking nearby. Refreshments will be available, including Ploughman's lunches and home-made cakes. We have received the sad news that McBean's Orchids will close at the end of this month. Unfortunately it has not proved possible to find a buyer for the nursery so it will close on 31st October. 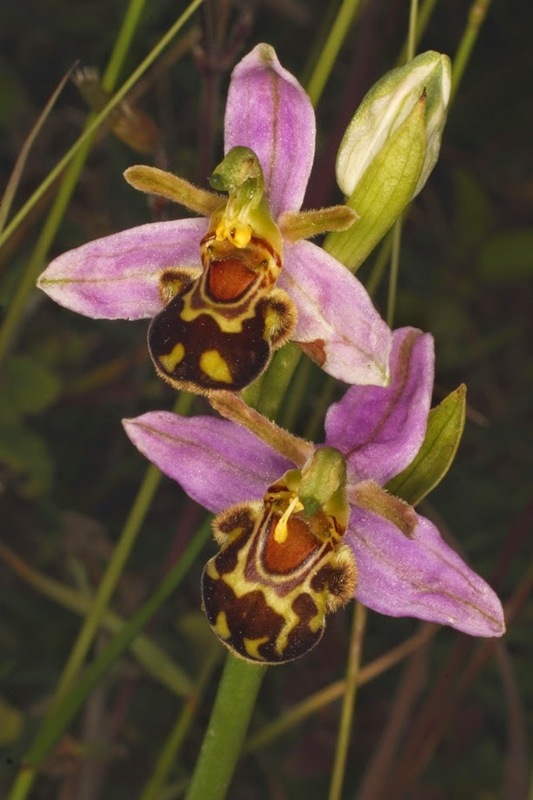 They will be selling off their stock of plants which includes an incredible and historic range of cymbidiums and odontoglossum-type oncidiums, along with a multitude of flasks. Discounts will be available on purchases of five or more plants. If you are interested please contact the nursery directly as soon as possible: tel: 01273 400228, Resting Oak Hill, Lewes, BN8 4PR. There are still some places left for the trip to Borneo in 2015. 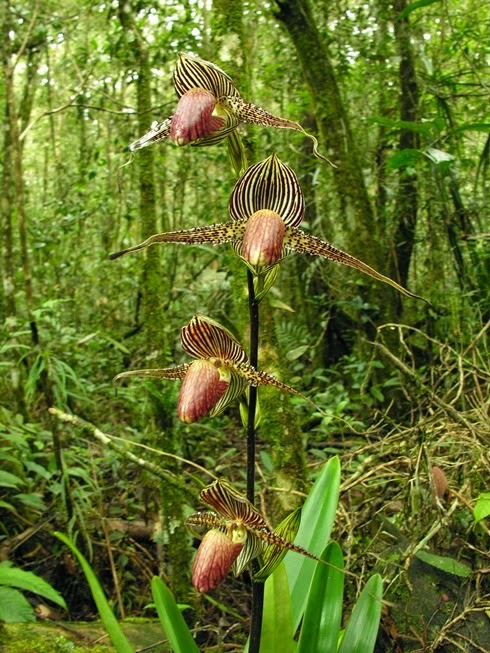 The trip will focus on visiting four locations to explore Borneo's amazing diversity of orchids, led by experienced field naturalist and Borneo expert Stewart McPherson of Redfern Expeditions. Please see the travel page of our website or the OSGB Journal(2014) 63(2): 129 for full details. 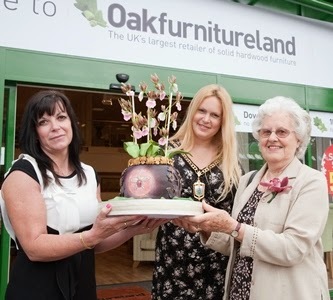 OSGB Vice President Jo Kelleher received a beautiful cake on behalf of the society in June which was presented by Oak Furniture Land at the opening of their new store in Orpington, Kent, where both Jo and OSGB Display Manager Jeanette Beaney live. 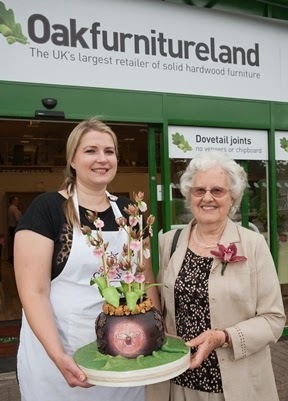 Oak Furniture Land paid tribute to the OSGB’s success at Chelsea by asking Kent-based cake artist Francesca Pitcher of North Star Cakes to design a cake in the shape of a jardinière of Eulophia guineensis. This species appeared on our Chelsea display as it is native to the Sultanate of Oman, whose Ministry of Tourism sponsored us again this year. The cake is based on the stylised aesthetic movement in art, specifically British porcelain of the period. The jardinière is decorated with one of the species from this year’s gold-medal winning display, Cattleya purpurata, while other sections are based on enamelled jewellery depicting a generic Cattleya design. The astonishingly realistic Eulophia guineensis spikes were made from sugar and floristry wire, then hand painted in edible dusts. As no cutters exist for this flower the artist spent a day working on three prototypes before work could begin on the three spikes which took a further two and a half days to produce. 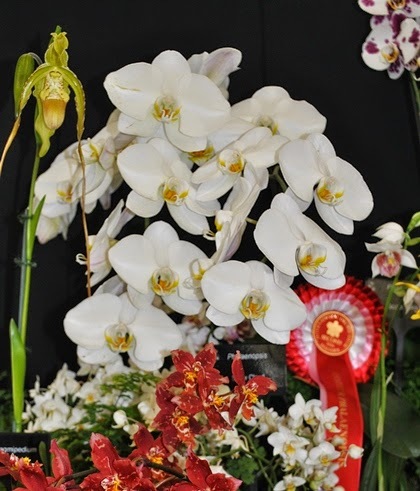 The society received a Silver-Gilt medal for its attractive display at last weekend's Malvern International Orchid Show. Held at the Royal Three Counties Showground, located beside the Malvern hills, this thriving show is an excellent reason to visit this beautiful part of the country. The display featured a wide range of orchids including Anguloa x ruckeri, Maxillaria hennisiana, Encyclia Rioclarense and Dendrobium antennatum. A large,branching-spiked Phalenopsis Sogo Yukidian on the display was awarded 2nd place for Best Amateur Phalaenopsis by the show judges.